To gauge how well Americans are saving, GOBankingRates conducted a survey that posed the question, “How much money do you have saved in your savings account?” The good news is that over half (51.3 percent — totaling all answers besides $0 and “I don’t have a savings account”) have at least something socked away in savings. But the survey findings also reveal that most Americans’ savings account balances are falling far short of where they should be. The most frequently selected amount that people say they have in savings is also the lowest $0; 28 percent of people selected this answer. Even worse, the next-most-common answer is “I don’t have a savings account,” selected by one in five people (20.7 percent). Of people who have something in their savings accounts, the most common balance is $10,000 or more, a sign of financial health for those savers (14.2 percent). This amount is followed by 5 percent who have saved between $5,000 and $9,999, 9.9 percent who have saved $1,000 to $4,999, and 13 percent who have less than $1,000 in savings. 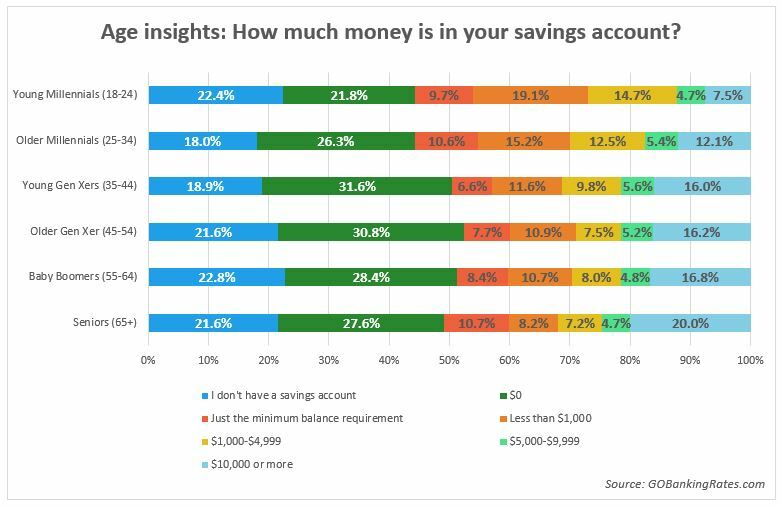 Another 9.2 percent of people say they keep just enough money in their savings accounts to meet the minimum balance requirements — a smart move that at least helps those depositors avoid maintenance fees. Minimum balance requirements can vary widely, however, and can be set relatively high compared with what most people are able to save. Bank of America, for example requires a minimum average balance of $1,500 a month to avoid its savings account fee, while Chase’s requirement is only $300. The survey shows some correlation between the balances of Americans’ savings accounts and their ages. For example, younger millennials (ages 18 to 24), known for their saving prowess, report having a smaller savings account balance of $1 to $4,999 more than other age groups. Older millennials (ages 25 to 34) — sometimes referred to as Generation Y — follow closely behind. Generation X (ages 35 to 54), while being older and presumably more experienced with money, actually report a savings account balance of $0 (31 percent), which is the highest number of all age groups. Only 16 percent of Gen Xers report having savings of $10,000 or more. Baby boomers (ages 55 to 64) and seniors (65 and up) have the most money saved of any age group, with a full 20 percent of those past retirement age reporting savings of $10,000 or more. Only 7.5 percent of younger millennials have this much money saved. Overall, men and women report not having a savings account or having nothing in their savings accounts equally. Women are slightly more likely, however, to save a smaller amount of money, selecting the answers “less than $1,000” or “just the minimum balance requirement” more often than their male counterparts. While similar numbers of men and women report savings balances of $1,000 up to $9,999, 60 percent more men than women report a savings balance over $10,000 (16.4 percent to 10.4 percent, respectively). People with higher incomes tend to have higher savings account balances. Those making less than $75,000 a year report having $0 in savings more often than people who earn more money. This income group also reports lower balances like less than $1,000 or saving just the minimum required balance. People earning $75,000 or more, however, are more likely to have more than $1,000 in their savings, and those earning at least $100,000 report having $10,000 or more in savings more than any other income group. While 27.7 percent of people earning more than $100,000 and 18.9 percent of people earning $75,000 to $99,999 report savings account balances of at least $10,000, about 20 percent of every income group earning less than $100,000 report having no savings. If you’re in the majority that has less than $1,000 in savings, you already know that it’s hard to start saving. “I recognize that it can be tough to save money,” Huddleston said. But that’s exactly the reason you need to be proactive and actively work to make a change with your savings, she said. Methodology: This survey and the findings reported above are the results of a Google Consumer Survey conducted from Sept. 11-13, 2015, which collected 5,006 responses. The survey posed the question, “How much money do you have saved in your savings account?” and provided the following as possible answers: $0, “just the minimum balance requirement,” less than $1,000, $1,000-$4,999, $5,000-$9,999, $10,000 or more, and “I don’t have a savings account.” The responses are representative of the U.S. internet population, with a margin of error within 1.70 percent. Demographic information was not available for all respondents, and analysis of responses by demographics is based solely on responses for which the targeted demographic information was available. These are the best savings accounts to grow your money.